One thing is for certain - menopause is inevitable. The experience for each woman is unique, but most would agree it can be a difficult period in life. Although you can't escape it, there are ways to make life during menopause more bearable - and even enjoyable. It is important to remember you are not alone, even though your symptoms may make you feel that way. The menopause journey is different for every woman, and thus, a plan of action can be tailored for you specifically. Whether you are sailing through mid-life or experiencing bothersome symptoms, the following are tips to help lighten the transition. B-complex. These vitamins help balance moods. Fatigue is a common symptom in B12 deficiency. Without the supplemental B vitamins, your brain's energy source will deplete and you may experience symptoms such as depression, irritability, and anxiety. Hormone-regulating supplements. These natural supplements help support hormonal balance in women and thereby provide relief from symptoms experienced during menopause. Exercise offers you the best possible feel-good boost out there. When you exercise, your body releases endorphins that replace your blues with joy. You don't have to summit a mountain or run a marathon. Something as simple as a daily walk or yoga class will do the trick, as long as you are consistent. On the plus side, walking 10,000 steps a day will burn up to 3,000 calories a week. Not only will you feel better, but you will look better, too. It is also important to get out in the sunshine often. Vitamin D can boost your mood, and your body makes it under the sun. 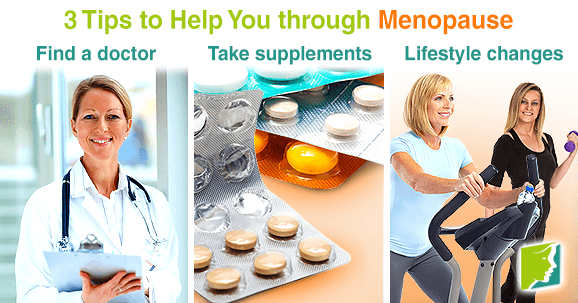 Every woman will go through menopause at some point in her life. Mild changes, such walking or taking the stairs instead of the elevator, are helpful tips to take during menopause to conquer your symptoms and revive your womanhood. Also, don't be afraid to talk openly about your symptoms, and seek help if you need it. Click on the following link to read more about menopause symptoms treatments.